Update: This story is corrected. July 21, 2017, © Leeham Co.: Lufthansa Airlines’ indications that it may reduce the order for 20 Boeing 777-9s underscores caution with which the program should be viewed. Emirates Airline already rescheduled its first deliveries from 2020 to 2021. The largest customer for the 777X, with 150 orders, EK is now pressured with falling profits, excess capacity and it’s one of three Gulf airlines under attack by the Big Three US carriers for alleged violations of Open Skies pacts. Two other principal 777X customers, Etihad Airways and Qatar Airways, are also targets by the Big Three. Their complaints appear to be gaining some traction in the Trump Administration. Etihad’s investments in other airlines proved to be a failed policy, depressing profits. Qatar’s latest financial reports indicate its profits were due to business transactions outside of its airline operations. Boeing is fond of dissing the Airbus A380’s over-reliance on Emirates and the A380’s narrow customer base. But Boeing is in a similar position with the 777X. Emirates alone accounts for nearly half the 777X orders. In 2021, 2022 and 2023, it accounts for the vast majority of production slots. In two of the three years, it’s schedule to take delivery of more than 40 airplanes and in the third year, more than 50. This is 55% to 65% of the currently scheduled deliveries. Add deliveries to Etihad and Qatar, and nearly all deliveries in these years go to the Mid-East Big Three. Cathay Pacific Airways is under financial stress. The Undisclosed orders are those going to Singapore Airlines. Along with ANA, these are the two financially stable airlines in the 777X customer skyline. SQ is also in some trouble…. So is the story here that Boeing tried to go cheap on the 777X? They stretched it to improve the seat-mile economics rather than reworking the plane with lighter aluminium alloys or a composite fuselage. They did this to get away from the A350. So Boeing’s answer was to build a plane that’s compromised on range (787-10) and another plane that’s too big for the market (777x)? Boeing should never have done the 777X. Note it has nothing to do with the 777X as it stands. It has all to do with ME customers and too large a part of the market. It also has to do with a changing market. Its the closest thing to a 747-8I, its got its place, long term probably ok, short term, there will be pain, but also note that its 3 years from going into service. It does being to look more like the market is the 787 size and not the A350 and up size. I think the A 359 was targeted at the 777-200 replacement market, so was slightly higher capacity, while the 787 was supposed to be a 767-300 replacement. 359 is ~10% larger than the 789. Interesting that the A359 needs significantly less fuel than the size difference to the 789 would indicate. FlightAscend Consulting recently published an interesting article relating to sector lengths vs number of flights and “Air Seat Miles”. In brief a crude summary from their graphs. A)Sector Length (B)No. of flights (C)ASM. Surprizing for me was that sectors of 3K – 4K Nm accounts for approximately 18% of flights representing 24% of Air Seat Miles. From that if AB can do an improved A321LR with new CFRP wing with effective range of just over 4000Nm it could be worth it? But what stood out for me is the requirement of a lighter more fuel efficient aircraft with (2 class seating) of ~250 seats with range capabilities of 4K – 6KNm but also be efficient on sectors of <2000Nm. "Something" in size between the 767-200&300 with a range of around 5500Nm? Personally I think AB should be focusing on such an aircraft and/or a weight trimmed shorter range A359 rather than bother with a stretched 350K2 as the 777-9 market is potentially not that lucrative? If Boeing did not go cheap with 77X , they would’ve been in a worse financial position re this program due to much higher development costs but not much more or the same expected Rev$ fm customer contracts. Incorporating AL-Li would hv little weight saving benefit overall(Already proven by many tech trade studies shortly after 77X launch) but added some development costs and using CFRP would mean re-building the fuselage supply chain fm scratch(e.g. no CFRP autoclave exists on earth today that can house such fuselage diameter+shape) let alone the additional test+cert efforts required. 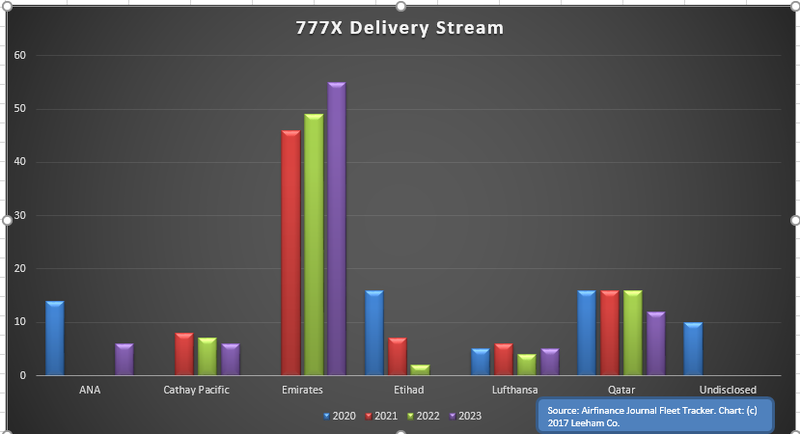 given today’s widebody mkt downturn in general, hv made the right decision to do it the cheap way with 77X….it’s the lowest cost way for Boeing to develop a product that can match 35K efficiency. And it worked because all types larger than 359/78J hv simply been not selling in recent yrs…not just 77X. The 35K is no better off in this mkt climate/trend. Since 77X was launched Nov2013, 35K netted a grand total of only 24 units sales(By IR and VS) across 3.5yrs….this reflects that both 77X AND 35K are too big for most customers in the widebody mkt these days. I also strongly disagree that 78J is “compromised on range”. 1st of all, it already has sufficient payload/range to cover the longest EU->continental U.S. routes and the longest routes within Asia-Pcf…both are huge longhaul mkts in their own right. 2ndly, not all carriers require extra longhaul performance offered by 359/789 for EU-E.Asia or Trans-Pcf routes…the sales success of the good old 330CEO is prove of that. Boeing never really position the 78J to compete with 359 on range(even less re 35K). In contrast, Boeing has always use 78J to target most of the 333 replacement mkt and as a result, compete more with 339 for a similar type of mission ranges. Is the “797” then going to be an 767X. I don’t have a problem with that, especially with uncertainty about the market size. A new single aisle justifies an “all bells and whistles” risk/investment program due to the potential market size? Could someone in the know please explain to me (or give a reference to) the 767 “double bubble fuselage story” – Thanks. The name 767-X was officially used once by Boeing 3 decades ago. today’s 777 as the 767-X…. On the other hand if I hv to bet technically what a 797 will look like if Boeing eventually launch it, I bet its specs, geometry and aero profile on the design blueprint will hv nothing in common with the 767….let alone any parts being re-used fm 767 and unlike 777 sharing the same nose/cockpit section with the 767. Hi FLX, a “new shape” for a 797 has been speculated for a long time.Was just wondering if they go that route if the Irkut/Russian autoclave technology could come into play? Airbus suggested that 2030 is a most likely “target” time for an NSA, just wondering what else do to they intend doing in the next 13 years? Hope not the 330NEO is the last thing “newish” from them until 2030. First delivery of the A380 was 2007, A350 was 2014, 2021 looks empty at this stage. Could it be a 14 year gap from the A350 (2028) for Airbus to the Airbus-NSA (it was a 14 year gap from the A330 to the A380). I have been going on that AB has better things to do than a stretched 350K1, and the current market climate supports that. Lufthansa does not order just from economical reason but from national reasons as well. They buy Airbus because Airbus is a German factory. There is no other reason to explain the prevalence of Airbus planes in their fleet. They even volunteered to be the launch customer of the lame A320Neo when Qatar refused to accept it. The hell with the cost. If I were Trump I would demand American airlines ( like Delta or JetBlue ) to change their policy and prefer American products. Really? Why did they buy the majority of 748 orders among major airlines? 232 Airbus in service . 32 Boeing (from them 13 747-400) . Data from Wikipedia. Not sure about accuracy but trend and strategy clear. It seems to be the only airline with both VLA quads, what sense is that. But they have more 747-8Is than A346s. And, as unsuccessful as the A346 was, it still outsold the 747-8I by more than 2:1. Bottom line is that the LH fleet looks pretty typical for an airline of its size. They choose one narrow body type – in this case the A320 family – and stuck with it, and nobody who is off Boeing’s payroll would ever argue that the 737NG/MAX are markedly superior to the A320ceo/neo. For wide bodies they have A333, A343/6, A359, B744, B748, and A388. Given the types of routes they serve the only “surprise” there might be that they chose A343/6 and B744/8 over 772, 77W, and (more) A388. However, I don’t know the timing of those orders (some likely came before 77W was available), and regardless there’s no clear preference for Airbus since almost half the “surprising” aircraft are Boeings anyway. LH has loved most of their A340 to death. I don’t think that they were ever unhappy with those frames. Maybe one should mention that the A340 was mainly designed and driven by Lufthansa’s demand – they would have preferred Airbus doing it before the A320, thanks god they didn’t – and as most of airframes design on demand of a single or a few customers it wasn’t the most successful (refer also to Trident, VC-10, CV880/990 – well that was mainly screwed by its “founder” (to small cross section) – A310 (too small wing) etc.). While Boeing was smart enough to enlarge the 737 design even before first flight of the -100 (designed for Lufthansa) to make the -200, which was successful (sadly that didn’t worked with the Trident…)…. I think the fact they have LH Technik could play a role in have almost all aircraft types in the fleet, maybe a way to have experience in maintaining these aircraft and sell the service to other airlines. According to this logic, Boeing should close it’s factories in North America and relocate them to Germany. It is not biased against Boeing. It was the only real 747-8I customer. That to may well have been a stupid decision as they are going away announced not longer after they ordered them. Part of the 787 fuselage is made in Italy and yet they havent ordered any Boeing or Airbus new products. Italian Airlines is on life support. They could not afford a shopping cart right now. Funny that the acolytic proponents of market “driven purchases” invariably assume non market forces when “their” product is deemed less suitable. Lufty is a strongly opportunistic buyer. Additionally they do not follow the mainstream mantra and take great care on getting their airframe capabilities granularity just right. They also like some influence on the design. At one time Boeing matched that template: voila: the 737. In recent years it was mostly Airbus or Airbus frames that were attractive. A more recent exception 747-8i ( LH influence on design). Then the 748 was to a part compensation for some promised but canceled sat com system. The 777X order then again is to a part conversion of 748i purchase rights. The larger order at the time contrasting the A350 order with less direct orders and a substantial options was a bit strange. IMU Boeing must have been very forthcoming on conditions to scoop that order at the time. And knowing LH it must have included “easy retreat”. Again: I call Baloney on your statement . I agree. Lufthansa, bei g German, would put the ehole thing into an equation jobs benefits fron Airbus, jobs benefits of more economical aircraft for Lufthansa by their own weights and pick the winner. That simple. Overall, they would have anticipated better economics for the A346’s etc. And they were wrong. Too much attentionn to micro economics can come at a cost to macro economics. Seems a bit out but ? Certainly they seem odd but not biased in the least. Wow. I certainly hope we’re not heading towards that sort of national-industrial command economy. This country still values freedom, even if our current president is a bit overblown and bossy. Delta should, of course, buy whatever aircraft best suit their needs (JetBlue too), including used Chinese-built MD-90s if they can find ’em. Or Norwegian’s soon-to-be-distressed-priced A320neos. Well some people who are ignorant (note that is not stupid) from the facts will make statement like that not knowing how global the industry is. Snapped together in Alabama or Everett/Renting. comes form all over the world. Large parts of the 777 and 767 are made in Japan aside form the large parts of the 787 made around the world. Lufthansa Technik has a major influence on aircraft and engine purchases by LH. LHT needs LH to buy specific aircraft/engine combinations so LHT get the licenses to service those aircrafts interesting products, (mainly engines, landing gears, nacelle, APU and avionics). LHT is more profitable than LH so far. Well Virgin, South African, Iberian continue to this day with A340-600. DLH seems to be the biggest user and they only are operated out of Munich. SAA has particular requirements out of hot and high ( 5700ft) Johannesburg. The A340-600 was designed too Heavy and with too powerful Engines costing too much to operate. LH was involved and wanted better climb performance than the A340-300, RR put together the Trent500 from modules they had and Airbus top management could not see the terrible truth that it became too heavy, too expensivve to operate and that the 777-300ER would kill it. The A340-600 was launched as a 747-400 replacement well before anyone had the idea of doing a 777-300ER. The 777-300ER had its first flight in 2003.
the 77W was Boeing’s ( with massive help from GE ) answer to the A340NG! Strong PR levered to boost generational advantages to “all about Twin vs Quad engines” was perfectly designed entanglement of the competitor. What ever improvement Airbus could make to the A340NG : the perceived Quad downside was undroppable. Repeated with the 787 later: The 787 hype could not be bested by mere efficiency advantages. only an Uber 787 like plane would have been a viable counter. American companies has to support American products. Falling back, falling back all the time. American made products do not compete adequately on quality/performance. rsal: It does not work that way anymore. American Government should do its best to keep jobs in the US, but that has to do with tax policy and willing to fight the corporations that benefit from that. Considering what we have as a leader is the worst offender for bought in China stuff, I would not hold my breath over that one. Maybe the 340-600’s are fuel guzzlers but they do JHB – NY (7000Nm) without significant take-off and range issues, done it a few times. A LHA340-600 served for several years the route from Tel Aviv to Frankfurt. It was very comfy. Once ended up i a Virgin 340-600 in E+ (2-3-2), not shabby for the price. Johor Bahru to New York. Surely out of range for A340-600! Maybe in one direction depending on winds but not as regular service both ways? 9500nm is close enough to 10000nm to make that moot. If you don’t like the winds one way you just turn around and follow the prevalent winds in the opposite direction. Please note that Boeing’s order book never showed 34 777X orders for Lufthansa. Precisely. The confirmed portion of the order has been 20 units. Some of LH ordering is more to get MRO rights for Lufthansa Teknic than airplanes for the fleet. LH have complained from the start about this program being overly influencia by the ME3 and ending up as too much airplanes. So a combinación of factores here? Lufthansa complained that aircraft in general were too long a range and this was driven by ME. Me thinks they are contradicting themselves and have no clue where they are going. The maximum range is for passengers and baggage only, as the 777 does have a considerable additional cargo capacity, that added weight means the range drops down. Then for a lot of shorter flights you can do away with fuel in the centre wing box, which reduces range again. For airlines who arent going to be flying at maximum gross weight they can choose a derated thrust engine. I am just passing on what Luft said. I thought it was bs at the time and still do. They wanted to drive the train and Emirates was not letting them. Agree with David and want to add that Spohr and Enders are very good buddies, going hunting and fishing together and are on first name basis ( means more in Germany than here ). They often give joint interviews. No wonder LH is Airbus’s best customer. Reduction of the order or even all out cancellation was long rumored. And United is not pro-Boeing as is a few other US airlines? About 160 Airbus in Fleet ( more the 20 percent ). 50 787 in fleet or order. 35 350 in order. AFAIK almost all of those Airbuses are from pmUA. The exact numbers are 21% Airbus for UA and 12% Boeing for LH. But the UA Airbuses are 100% NB (list price $99m) and the LH Boeing are 100% VLA (list price $379m), so in terms of share of fleet value (and it’s $$ that matter to Airbus and Boeing shareholders) the two are pretty close in terms of their minority shares. If anything LH’s Boeing fleet value share might be higher than UA’s Airbus fleet value share. Get your Math right. Just 19 7478i bought in the last 20 years. The 747/400 are from different era. The 748 is the exception that reflects the rule. They are buying anything that Airbus is producing. Together with Aerologic they bought 9 777F for delivery 2009/2010. Swiss will have 10 773 delivered 2016/2017/2018. LH still have some 13 late 744’s delivered since 1998 – still not 20 years. ….and There are the now famous 100 MAX10 orders and 60 odd 737-900ER outstanding orders. I am curious about UA’s review of the 350-1000’s, AA and Delta will be operating 359’s. “Only” way to compete with the ME airlines is the 350-1000 and “mass attack” with a MoM linking “smaller” city pairs. Also, with the A359ULR you could basically link Chicago with any destination in the world? Off course. United should have bought the PW powered A320 Neo and not the Max. Any prudent CEO would have done just that. And A359ULR might be able to connect Chicago with any destination in the world. The question is whether it will be able to do it profitably. The 359 is a great pax plane, flew now three times on it. (SIA and Qatar). Believe the 350-1000 could prove to be a very efficient aircraft in future for airlines (and it does not have folding wing-tips). 744 – Delivered since 1998. Ordered probably in the early 90’s. Airbus did not have a competing product in the early 90’s. 777F – Does Airbus have a competing airframe? They just introduced a direct pax 777 competitor (A350). They don’t have a competing freight airframe. On the freighter side Boeing is tops. Once thought about an A330-1000 (~4.84m stretch) that can compete with the 787-10 (especially on price) and also be used as a freighter to keep the production line going. Maybe with an Ultra-fan and possible 248 MTOW on the horizon it is not to far fetched (stretched)? Please let us agree that you buy a product when it is delivered to you. Before delivery we call it an order..
Anton: What have you against folding wing tips? All the best Navy fighters have them, big birds to. Works fine, lasts long time. I am just being old fashioned. Flying in one with folding wing tips will probably be like the first time I flew Transatlantic in a twin. A theoretical A322 could likely also have folding wing tips to stay in CAT-C? Was wondering about the “797”, a high aspect ratio wing will put it way North of CAT-C? Afair Airbus has some patent or other on “self-deploying wing extentions” for a Narrow Body aircraft around. google brings up more .. Thanks Uwe. What will the reason be for it fold down and not up? Air bridge to the rear door maybe? move them into the extended position. Downside is potentially higher susceptibility to ramp rash. It’s written on the page Uwe posted: “…upwards folding wing “requires heavy actuators and/or locking systems”. They also point out that during flight the forces of flight are “urging the wing to the folding position”…”. Thanks, think its time I get anew pair of glasses! Expect LH to act their character and buy opportunistic. There are those A350 frames that Qatar canceled available currently. I would not say that Lufthansa orders purely Airbus because they are a german Airline. They are one of the few customers of the 747-8I. They have a huge fleet of E-Jets and a smaller one of CRJs. For Swiss and Austrian they have ordered 777. For the cargo business they are switching towards 777F. And when they ordered 777Xs and A350s in 2014 the number of 777X was even higher (34) than the number of A350s (25). Of the ~740 B777-330ER’s delivered to date 670 is 10 years old or newer, the short term replacement requirement most likely for 777-200 variants. Maybe be the 777-8 should have come first, could be in the numbers with the 787-8 “stigma”. But the B778 is a niche aircraft. Same MTOW as the B779, so you’re basically just trading passengers for an additional ~1,000 nmi of range, and the B778 doesn’t look great against the A35K. It’s the same tradeoff as the A338 vs A339, and neither of the “8” varieties is selling well. Strangely there is no real need to choose the -8 in the first place. The 777 should have been the -4, the A380 should have been -1 and so on. The 8 is supposed to be auspicious in Chinese or something. But airlines dont seem to use that method in buying planes ? Sowerbob: You have e my vote. You have mine as well! Was wondering where you could you rate the DC8 and MD80 in the success categories, possibly marginal? On something different for a dummy like me; are there and if, what is the key difference between a GTF engine and Ultra-fan engine? Could an Ultra-Fan engine “rescue” the 330-800? Better engines increase range across a type family. Better range moves the larger model in a simple shrink series (further) over the “magic range” demarcation line further demoting the smaller model now over ranged. See production numbers for A332 and A333 over time. The 332 looks actually nice in the LEVEL colors, I have a soft spot for this aircraft and spends basically 22 hours each month in one on one route. I think if you look ay the better than expected capabilities of the a350, at such a young age, and the more tuned/fillable size, maybe the 777x is looking a bit too-big/too-old-school for many. If you already have the a350… The reason for yet another model maybe isn’t too sensible. LH doesn’t want to work a deal and switch back to the 747-8? I always thought the A350/747-8 combo made sense for product uniformity with 20″ center to center seat and aisle width. Same for he 787/777 combo at 19.5″. It certainly is not 20 in seat at 10 across. But the whole discussion should be seat center line to seat center line which includes the armrest and gives a better idea of perceived room. And then there is the seat pitch which is totally up to the airline. Center to center. 240″/12 for the 747, 221″/11 for the A350. Boeing just delivered its 1500th 777. Airlines are cyclical in nature and while wide bodies are presently slow selling, the 777X should do well. I see it as being a partial replacement for the A380 which appears to be on the skids and the many older 777’s. The 777X has killed off the 748 passenger jet rather than the 380. The last 748I for a major airline order was 2012 with Air China. It was 2011 when Boeing made public its 777X studies and Sept 2013 when Lufthansa made its launch order. Since 2012 there have been 62 A380 orders., and currently 213 in service. The 747-8I its hard to tell how many are in service as passenger jets, as some airlines have a mix of freighter and cargo planes. There is also a sizable VVIP contingent. So all up there could be under 40 747-8I flying in revenue service. I have to disagree. The 747-8i killed itself off, just did not offer any better than the 777 but had 4 engines. The 777X is killing off the A380, best of all worlds and more flexible. 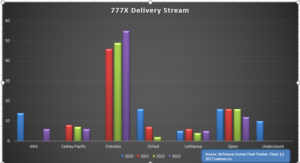 The evidence is that the 7478I orders came to a screeching halt once the 777X was anounced, the 380 continued. Which airline is ordering 777X instead of A380s? The difference in capacity is substantial. The latest 380s being delivered for Emirates have 615 seats, Asiana has 495 seats. ANA seating isnt finalised but its going to be between 500 and 600 seats. As for the 380, the order book speaks for itself. Something on the ME-airline front. These airlines obviously had major impact on the airline business. Has consideration been given for a “Dubai-like” hub on the US West Coast to serve the Far East, Asia, China, etc? Airlines in the US can feed into it and then larger aircraft serve major destinations to those areas. 1)Seattle to Singapore, 7000Nm whereas. I am not trying to sell A380’s to an US airline but there is one “hell-of-a-lot” of water between Sydney and LAX, four engines will feel better. The airports in Dubai are national projects, built using state’s money. I don’t see support for that in the US. If they have problem with the maintenance of their infrastructure (this is what I read, not that I know much about the US), how can they build a new mega airport? Me to about the US West coast, know the East coast and Southern areas reasonably well. Just thought of the West coast areas as a potential “gateway” to Asia from the US. Maybe some form of collaboration between the US “Big Three” airlines and their code sharing partners. Even involving “US only” airlines such as Southwest for domestic code sharing on the LCC front. Anton: They don’t care how we feel about engines. I think you are way to far South. Anchorage is the air crossroads of the world and the natural place for A380s. Plus we have great scenery, not that drear drab dessert thing. Hi Transworld, was just wondering about the weather. How many days/weeks a year is the airport difficult to operate from? With Brexit looming I was wondering about the Heathrow/Gatwick hubs. Could there be upside for Brussels, it has 3 fair length runways (3.0, 3.2, 3.6km). Just as I was talking about Brussels came across this today. Vancouver is one of my favorite places, never been to Alaska but can believe it must be scenic. Maybe must try to hop over there when in Vancouver, assume Visa requirements same as for the US? the spokes are all of similar ( middle to long ) range length for the ME3. It is a rather symmetric system where only capacity for each spoke needs adjustment. Halving hop length is optimal. Hub inside catchment area would have short range local spokes and long range “overseas” spokes. Hi Uwe. Definitely not my line of of expertise (tell me to break 10Mt of rock a month and I will do it). Its just that airlines (and countries) need to start standing up to the ME carriers (and I don’t mean laptop bans). They are busy killing a number of smaller airlines and changing the culture of the business. OEM’s are also thinking (I guess), will the ME airlines place a big order for X or Y of my products while there are airlines out there for which their three or so A319’s may mean more to them than 100 777X’s for an ME airline. On a different note on the CS300/Air Baltic, these type of things make me happy. Anton, I had been thinking this ever since Delta bought NW. And they have been doing this, but their plan must be more frequency instead of the B747, with the A350 taking over (approximate 10 350s replacing maybe the 4 B747? Now, Delta is covered way southeast, and the upper Northwest. Hi Sam, think Delta’s 25 A330NEO orders are a bigger problem for them than United’s 35 A350K1’s is for them? Just out interest even now existing A330-300’s are doing up to 11.5 hr flights, eg Seattle -Beijing is just over 11 hrs, while HK to Seattle is 13.5 hrs in a Delta 332. Obviously a 330 neo could do better, even doing the north asia coastal cities from LAX. I am probably a bit dense here. or just drop the 14 “OPTIONS”? And what will happen to the 30 “options” mentioned at the time? If you look at the current Lufthansa fleet, the smaller wide bodies, the A330s, A340s and 777s, need to replaced first with at least 60 A350s or 787s or A330neos. The A380s and 747s are much newer and don’t need replacing any time soon. Have anybody an idea what the “ballpark” development cost for the 777X program is? The Boeinginista Hivemind offered $14..16B on a.net. A conservative estimate? No idea. Thanks, so thats around the A350 development costs? Wikipedia mentions an estimated 11B _€_ probably in 2010..13 Euros. you are probably right. Though no hard numbers around for 777X. Strikes me as way high. $16bn should get you an entirely new airplane, not a derivative. Thanks Scott, apologies, only saw your response. It is a bit rich for a hybrid type of 777MAX development? Maybe Boeing still have some jitters after the 787? Derivatives are the normal way to meet the changing markets over many decades. Look how far the A300 came to be the A330neo ! It too almost ended up just with a new carbon wing like the 777X. See China is also talking about International Hubs, will this hurt the ME airlines and what will their aircraft of choice be? Beijing for example is not badly located, 4400Nm to London, 5200 to LAX and 6000 to NY. Think Qatar is wise trying to get a foothold in India, if they can operate east from there Emirates could have problems? China hubs ? They are wrecking the one they have now , Hong Kong with the common ATC long delays. The idea that transit passengers will use other congested Chinese airports doesnt really follow. Hi Keesje, this is indeed sad news for the 747, wonder where they will go. Maybe to a LCC fitting it out with 550 seats? What is the seat mile cost difference between an A340-600 and 747-8? Some airlines are in real need to replace old 346’s and backlogs on new twins are many years. 777ER’s replacing it most likely the best short term option if they can’t wait for the 350K1 or other. That story is from 4 years ago. That of course was before the price of fuel fell substantially.